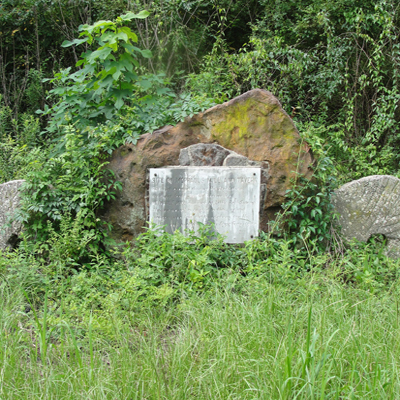 The stone tablet is attached to an irregular shaped monument constructed of native brown sandstone with two millstones to either side and marks the spot where the mill once stood. The stones used in construction and millstones were rescued form the remains of the mill and incorporated into the marker. SITE OF MCPHAUL’S MILL AND TAVERN / RALLYING GROUND DURING THE AMERICAN REVOLUTION. NEAR HERE TOOK PLACE THE SKIRMISH OF / MCPHAUL’S MILL AND THAT OF LITTLE RAFT SWAMP. THIS MEMORIAL IS ERECTED TO THOSE VALIANT / PIONEERS WHO LAID THE FOUNDATIONS FOR THE / CULTURE AND PROGRESS OF OUR CAPE FEAR REGION. The dedication ceremony began with a service at the nearby Antioch Presbyterian Church before moving to the monument site. The church address was delivered by the Rev. Dr. J.E. Purcell of Richmond, Virginia. His comments included a concern for the environment, observing that recent generations may have “overdone the pioneer work of clearing forests and tilling soil to the disparagement of both, and urged rehabilitation.” Speaking on the purpose of the occasion he noted that the erection of monuments was “almost a passion of the human race.” Representative Ernest of Red Springs presided over the ceremonies which were supported by the Daughters of the American Revolution, United Daughters of the Confederacy and the Colonial Dames. Two young females, Margaret Ellen Kirkpatrick and Sara Hodgin Watson, both descendants of the first McPhaul settler in the area unveiled the marker. The marker is located on the Old Wire Road about 1.7 miles south of NC HWY 211 in Antioch Township which is located about half-way between Raeford in Hoke County and Red Springs in Robeson County. Although the marker is physically located in Hoke County it has a Robeson County address of 1551 Old Wire Rd, Red Springs, NC 28377. The area is very rural with few buildings. It is largely farmland but the marker is in an area that is wooded on both sides of the road.